← 3rd Crop Hay and Drought. 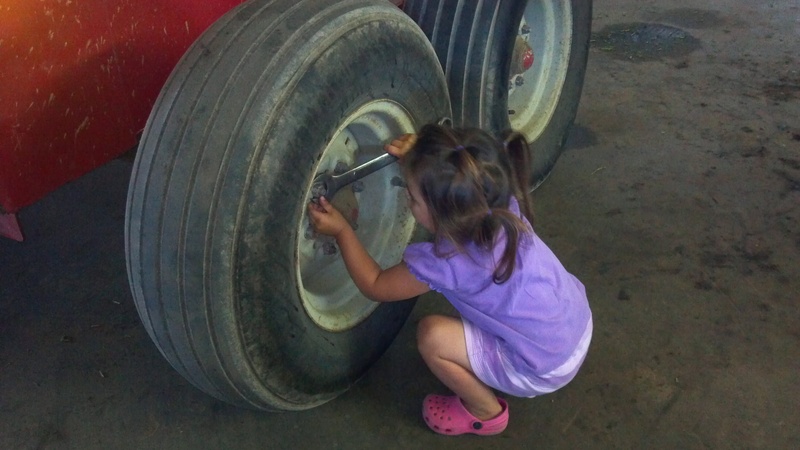 Zoie has learned that if things are in the shop they need fixing! 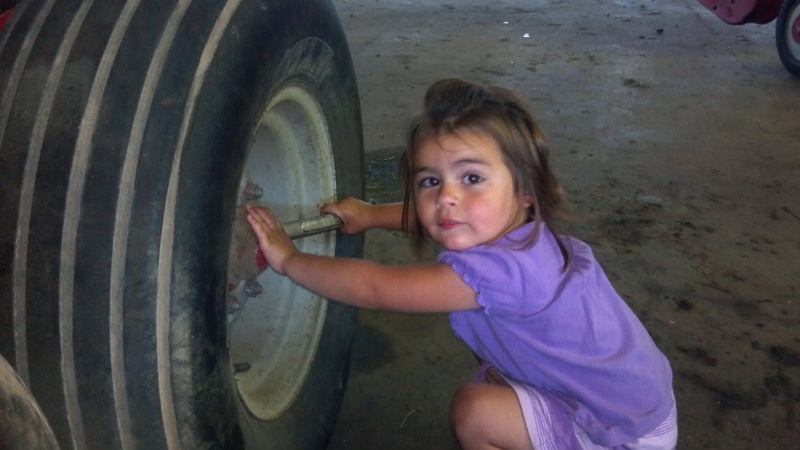 One of the choppers is in the shop getting some work done right now, so she asked if “Tractor broken?” I gave her a wrench and she said “Zoie fix it” and got to right to work! We baled a bunch of straw today. 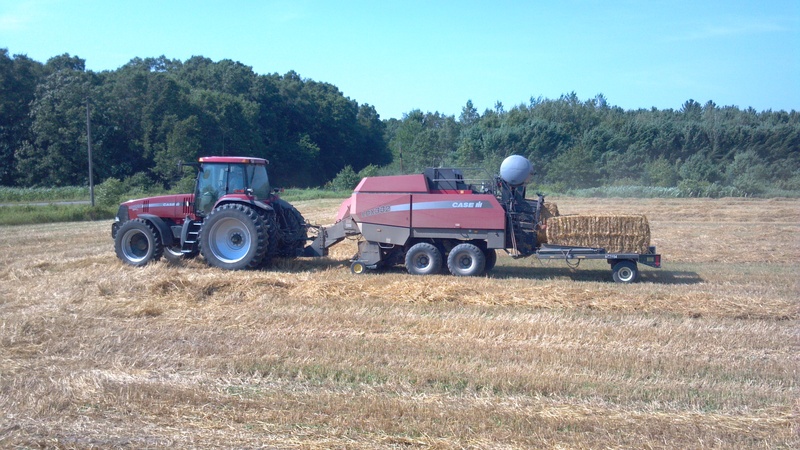 We don’t have a baler as we do very little baling, so we hired it done. 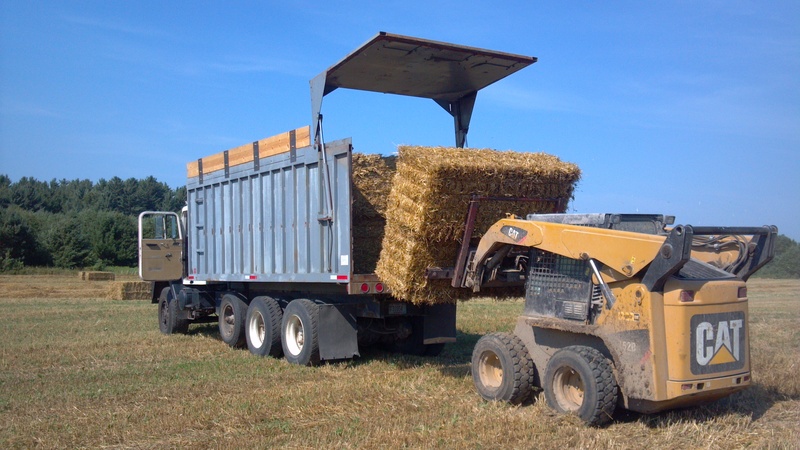 The cart behind the baler accumulates three bales before dropping them, allowing bales to be clumped in the field for faster pick up, rather then having to run all over the field picking up individual bales. Loading them up. Wheat makes beautiful straw that makes great bedding for calves. Sorry Mom, I didn’t get any pictures of the wheat being combined! This entry was posted in Agronomy, General Information, Machinery and tagged agriculture, agricuture, agronomy, Animals, case, case IH, combine, cute farm kids, cute kids, dairy farming, dairy farming today, factory farming, family farm, family farming, farm, farm animals, farmer, farmers, food production, John Deere, Modern Agricuture, modern farming, organic farming, production agriculture, Wisconsin dairy farming. Bookmark the permalink. 3 Responses to Zoie Fix It! Ha, your post reminded me that I needed to stain treat her shirt! She proudly told me later that she was wearing her work shirt! Good job, Zoie!….I’m sorry you missed the combining of corn pictures, too….I didn’t realize it was going on until it was all over!